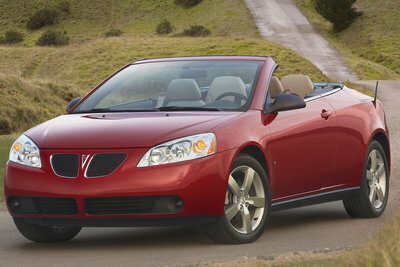 The Pontiac G6 convertible is a truly unique offering. This mid-sized coupe is built on the same front-wheel-drive platform as the G6 sedan. The GT is powered by 3.5L V6. An optional 3.9L V6 adds a little more horsepower. A four-speed automatic is the only available transmission on convertible models. The retractable hardtop is fully automatic and stows away under a double-hinged trunk lid in about 30 seconds. The retractable hardtop promises a quieter ride with more comfort in inclimate weather.